Lisa Lynch grew up wanting to be just like Indiana Jones. She now studies classics at the John Cabot University in Rome and is working towards her dream of obtaining a Ph.D. in Egyptology. But, since moving abroad, she has found herself doing something unexpected, too: she’s used her voice to be an advocate and educator for her culture and for Alaska Native life. Lisa’s most recent achievement is winning Miss Arctic Native Brotherhood. She told KNOM about her studies, how she hopes to use her new title, and what makes rural Alaskan students special. 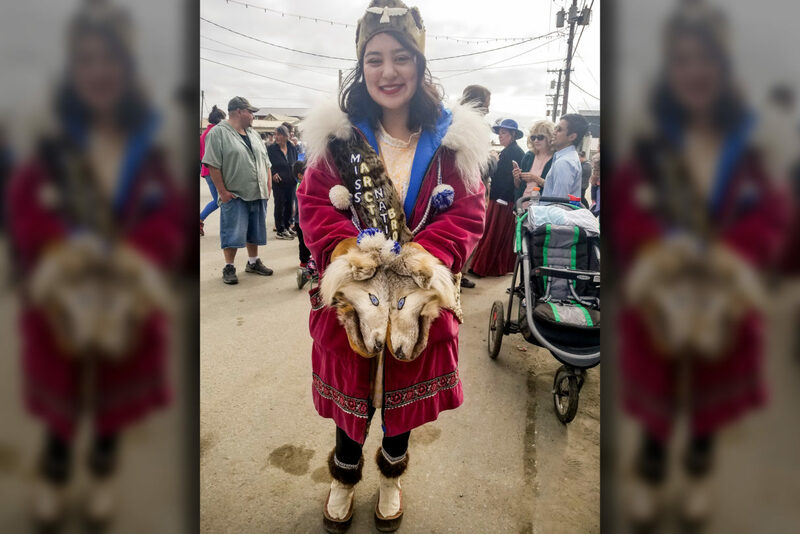 Image at top: At the 2018 Midnight Sun Parade in Nome, Lisa wears regalia handed down through her family, including gloves from the wolf her father hunted. Photo: Emily Hofstaedter, KNOM. friends, I really enjoyed hearing Lisa’s story. I liked her explaining the origins and significance of her native clothing that originates from her family, her pride and love is obvious. I also really appreciated how she knows that her upbringing in the tundra has prepared her for the long and difficult road ahead as she pursues her dreams and academic goals. I was disheartened to hear about the insensivity and rudeness of some of her fellow students, but I sense Lisa sees the larger picture and won’t permit these dummies from her pushing forward. She displays the emotional maturity and the determination for the challenges ahead. You go girl! What an awesome girl and her story! Lisa Lynch is all that I imagine a strong native hard working and smart sensitive person to be! Remain as you are representing the best of your heritage! Thanks KNOM for covering her and sharing her positive and encouraging strive to attain her goals! Lisa! I am jealous of your beautiful family made garments! Make sure you hand them down as you have added your story and provenance to them! Such a tremendous girl! Emily this is beautiful and Im so happy that you had time for me this summer. To be honest this brought tears to my eyes and I will share it with as many people as possible! Lisa, it was a privilege to have you share your story with us! Good luck in school and have a wonderful time abroad. Thank you very much for this interview. Lisa is exceptionally gifted in so many ways, and I appreciate her willingness to share her story, skills, and wisdom–even (or especially) when some people can’t appreciate and honor them. I have dear friends in Italy and would love to connect Lisa with them if she’s willing. I’d like to add that Emily did a wonderfully sensitive and respectful interview. Thank you! Thank you for your kind words! It was a true privilege to interview and share Lisa’s story.